Nvidia has also updated its Quadro lineup with a total of five new graphics cards targeting the mobile market. The flagship model, Quadro FX 3800M, which is currently the most powerful mobile workstation solution from Nvidia, has 128 processing cores, 1GB of GDDR3 memory paired up with a 256-bit memory interface, support for Shader Model 4.0 and OpenGL 3.2 and a maximum power consumption of 100W. 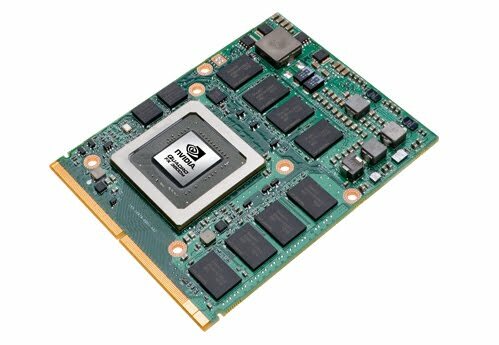 The Quadro FX 2800M also qualifies as a high-end part and features 96 processing cores, the same 1GB of GDDR3 and 256-bit memory interface and a slightly lower 75W maximum power consumption. The mid range parts, Quadro FX 1800M and FX 880M, have 72 and 48 processing cores, a 128-bit memory interface and are aimed at 15.6-inch notebooks. The FX 1800M supports 1GB of either DDR3 or GDDR5 memory and has a maximum power consumption of 45W. The Quadro FX 880M on the other hand sticks with 1GB of DDR3 memory and has a 35W power consumption. The entry segment was updated with a Quadro FX 380M model which features 16 processing cores, a 512MB of unknown memory paired up with a 64-bit memory interface and a maximum power consumption of mere 25W.